A couple of weeks ago, we received a tip that Google was on the verge of adding new shipping options for devices and accessories through Google Play. The new options were Ground and Saver, which would provide customers with discounted shipping choices should they decide that the semi-expensive 2-day option wasn’t necessary. Those new options are now live on Google Play. 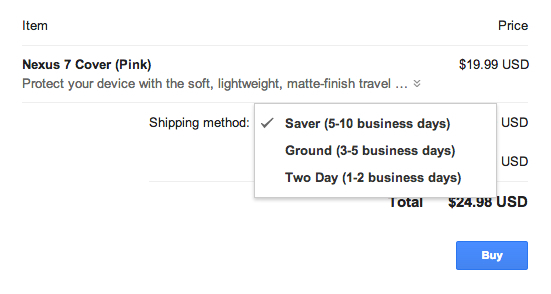 Depending on what you buy, Google will provide you with a couple of shipping methods. You’ll always have the 2-day option, but with some devices you’ll see a Ground (3-5 business days) choice as well. With accessories, we’re also seeing that Saver (5-10 business days) choice pop up. For example with a Nexus 7 cover, we’re seeing prices of $4.99, $7.99, and $11.99 for Saver, Ground, and 2-day, respectively. But with the actual Nexus 7, we’re only seeing Ground ($9.99) and 2-day ($13.99). Choices are good though, right? While we always love receiving items faster, some times the price to pay for quick delivery isn’t justifiable.